Ladies and gentlemen! Boys and girls! 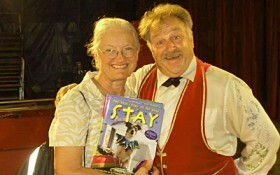 Step right up and read about a gentleman and his rescued dogs: Stay: The True Story of Ten Dogs! This book tells the story of the amazing life and career of Luciano Anastasini, an eighth generation circus performer trained in high wire acts until a terrible fall ended his career. He did recover, but his injuries left him unable to continue acrobatics. For Luciano, to leave the circus was unthinkable. Circus was his life, his family. He dreamed of a day he would be back in the center ring. Then an idea began to take shape. This idea involved four-legged partners. A circus act featuring...dogs! Read for yourself how ten unwanted dogs and one amazing man found each other and began performing a delightful crowd-pleasing circus act. Hear the heartwarming stories of Bowser, Stick, Sammy, Rowdy, and their other furry buddies. See how the dogs showed Luciano what jobs they wanted to do in the circus ring so each dog willingly and joyfully performs stunts to the delight of the audience. Linda Clay meets Luciano Anastasini. I have been fortunate enough to have actually seen Luciano and his amazing dog act many times and am honored to call him and his beautiful family my friends. I am always so thrilled to talk with them and hear fascinating stories of their life as circus performers. What a wonderful, loving family! If you love dogs and the circus, then this book is for you! I hope you enjoy it as much as I did.